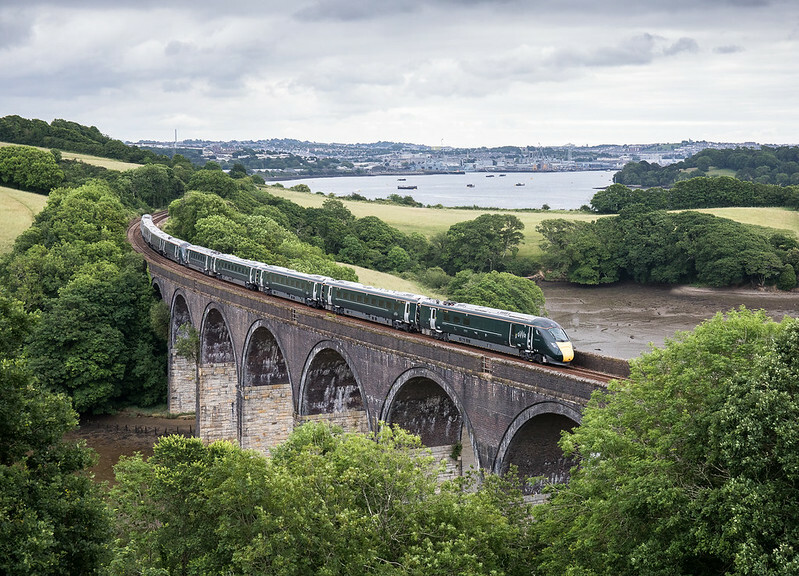 Great Western Railway’s first Intercity Express Train has made its maiden voyage to Cornwall this morning, as part of a very special test journey from London Paddington to Penzance. Part of an expo event with Cornwall Council to showcase improved rail services for the South West, the Intercity Express Train (IET) (800 003 and 800 004) left London Paddington at 0533 and arrived at Penzance Station at 1101. “We are upgrading our railways to deliver the biggest modernisation programme for over a century and the improvements that passengers have asked for. From 2017 this new fleet of Intercity Express Trains will connect London Paddington to Bristol and South Wales and from 2018 they will connect London Paddington to Exeter, Plymouth, Penzance and many more communities. "We know how important the railway is to the economies and communities of the South West, and today's event marks another milestone in delivering the improvements we know our passengers wish to see. The new rolling stock replaces 40-year-old trains currently serving this key intercity route This will mean additional seats into and out of the West of England, and will help speed up typical journey times from London by 5 minutes (to Exeter), 6 minutes (Plymouth) and 14 minutes (Penzance). The 93 train fleet is fitted with bi-mode technology, allowing trains to use both diesel and electric power, and passengers to enjoy the benefits of new trains as soon as possible. Prior to entering service next Summer, the train will now be made ready to begin testing on the network. The new fleet harnesses Hitachi’s pioneering Japanese bullet train technology, known for its quality and reliability. Passengers can expect more seats, better on-board facilities and shorter journey times. “Improving the signalling, upgrading stations and preparing the railway for the Intercity Express Trains marks a real milestone in the modernisation of the railway in the South West, as we continue to deliver our Railway Upgrade Plan. Ahead of the fleet of trains arriving in the South West, Network Rail has invested £47million to prepare the railway for the new Intercity Express Trains. The modernisation includes a £25million signalling upgrade as part of the Cornwall Capacity Enabling Scheme, which has been part funded by Cornwall Council to the tune of £15m. This scheme includes 21 additional signals added to the line and seven level crossing upgrades. The extra signalling will allow for more trains to be on the track, and will be controlled locally from the existing signal boxes at Plymouth, Lostwithiel and Roskear. A further £12m has been invested for de-vegetation in Devon and Cornwall and another £10m for gauge clearance as well as Totnes and Devonport platform extensions. The Intercity Express Train is designed to withstand the region’s variable weather conditions, including routes along the Dawlish coast. As well as the first visit from an IET, those in attendance will also be able to look at a new and improved Night Riviera sleeper berth. The Night Riviera service is being modernised and will include a new seated carriage, a cocktail bar and refreshed berths with hotel style keyless door entry, USB charging ports and a host of other improvements. See a video of the new sleeper here. From this autumn, the first wave of Intercity Express Trains will run on the historic Great Western main line, connecting London to key UK cities including Reading, Bath, Bristol and Cardiff. Production of these trains is already underway at Newton Aycliffe, County Durham. From next Summer a second wave of new trains will begin running as far south as Penzance along coastal routes in Devon and Cornwall. The first of these trains arrived in the UK on Saturday 17 June. This £500 million fleet is financed by Eversholt Rail and will be leased to Great Western Railway. The entire fleet of 93 trains (58 five-car, 35 nine-car) will be in passenger service by the end of 2019. They're being maintained in a new depot at Penzance. The doubling of the frequency from Plumouthvto Penzance is being achieved by retaining shortened HSTs which are presumably still being maintained at Laira? A lot of diesel maintenance is ceasing at Oak Oak Common. Trains like the sleepers will be maintained at Penzance. The 16Xs are going to Bristol. I strongly suspect Laira will continue to receive a lot of HST work. GWR will continue to run a fairly sizeable fleet of HSTs. So I cannot see jobs being lost from Laira. I'm not particularly excited about these new 800s either. They seem to have the same hallmarks as Voyagers! I think the shortened HSTs we get down here will be far nicer. Especially after they've been overhauled. I travelled on one of the refurbished Chiltern Railways Mk3 services a few months ago, and they are astonishingly nice. I hope GWR overhauls their MK3s to the same standards.